Modern automobiles have been including embedded technologies (dashboard GPS, cellular network support, CarPlay for iOS integration) over the past few years, a trend I don’t get to fully participate in as I continue to drive my 2010 Honda Civic (still going strong!). Some jealousy has seeped in, though, at how those cars are smarter than mine, so I decided to do something about it. 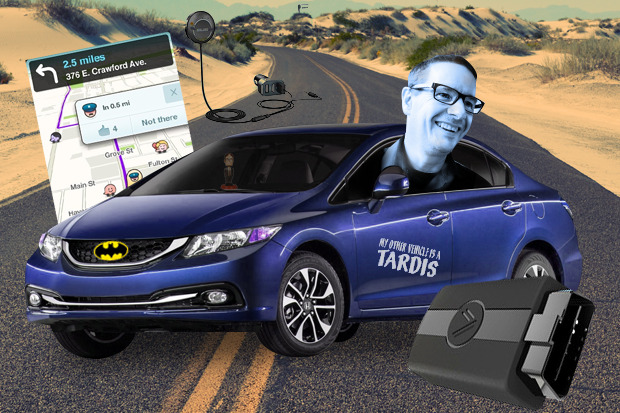 No, I didn’t buy a new car – I grabbed a bunch of gadgets that can help to smart-enable my older vehicle. First up, navigation. I’ve been a longtime fan of Waze, the GPS app that utilizes traffic information, but also that relies on other users to provide updated, real-time information (such as traffic slowdowns, hazards on the road, or, ahem, police speed traps). Since being acquired by Google, Waze has updated its interface a few times (and added some annoying advertising features), as well as celebrity voice navigators (some were good, some not-so-good). But it’s still the go-to app for my work commute and other navigations. It’s clear that the days of the stand-alone GPS are long gone – most people are using their smartphone to navigate, whether Waze or Google Maps or Apple’s “Maps” app (notice the air quotes around Maps). While TomTom still sells GPS devices, they’ve moved into the GPS-on-a-watch market for runners or off-road purposes. Trust me, use an app on your phone. Using Waze on a regular basis creates a few other issues. First, I needed a dashboard mount to make sure I’m not looking down when any alerts come up – a quick Amazon search reveals a ton of different mounts available, depending on whether you want to place the mount on the dashboard or windshield (and local laws may apply about which one you’re allowed to use). We chose an adjustable width mount that can secure both my iPhone 6S and my wife’s Galaxy S6 smartphone (shocking, they’re not the same width!). Second, using Waze uses a lot of the phone’s battery life, so keeping it charged requires a car adapter charger – I’ve previously praised the Choetech CHOE 51W, 4-port charger for its ability to recharge devices via four USB ports. Sure, fancy cars have two (or more) charging ports (or cigarette lighter ports, as they used to be known as), but remember, we’re talking about 2010 technology. A smartphone mount, charger and GPS app was just the first step. I wanted to go beyond the “table stakes” in this smart-car project, so I needed more gadgets. First was to provide Internet access for my vehicle’s passengers – those miniature versions of me who, shockingly, prefer playing games on their smartphones, iPods or tablets to playing the license plate game or other road-trip games that I had to endure (yes, I’m old, and yes, we always get stuck on the letters J, V and Q in the “ABC road sign game”). I could provide Internet access via a smartphone or one of those 4G hotspot pucks, but there’s an interesting wrinkle in my case. I’m one of those people who have the unlimited data plan on my iPhone from AT&T – so I can’t set up the phone as a personal hot spot without switching to a data-capped plan (I suspect this is part of an AT&T plan to reduce the number of people still clinging to those unlimited plans). If you have a smartphone on a different carrier (or have a different plan), then you could set up the smartphone to provide this hotspot for your car. Instead, I tried the Vinli device, which attaches to the car via its onboard diagnostics (OBD) port and provides 4G LTE access via its own Wi-Fi radio. The OBD port is used by service technicians to figure out what’s wrong with your car after the “check engine” light comes on in your 1996-or-later vehicle. I’ve seen devices before that plug into the OBD port to provide similar functions (so the car owner can know before they take it to the shop what’s going on with their car), but this is the first one I’ve seen that provides Internet access as well. The Vinli comes with 1GB of prepaid data access – additional data is done on a pay-as-you-go offering, with 1GB (for $15) or 3GB (for $40). You can also auto-renew data, which gives you an additional 500MB (for $6) every time you are down to your last 50MB of prepaid data. Vinli describes the data levels as such – the 500MB is enough for email and simple web browsing, the 1GB is good for music streaming, and the 3GB is good for video streaming (one assumes these are for monthly usage, based on similar monthly costs on other phones/devices). Knowing my kids’ obsessive usage for watching Netflix and other online videos, those numbers may be a bit on the low end; regardless, when I allow them to have Internet access via the Vinli, I tell them to use the access for their games: “No streaming or I’ll turn this car around!”. With GPS, car data, theft protection and Internet access now covered, my final step on making my older car smarter was to find a better way of playing music in the car. The easy way is to connect an audio cable to the car’s AUX port and play music directly from the phone, but I ran into a problem with a protective case I was using – the audio cable wouldn’t connect completely when the phone was in the case. Even with the case off, having a charging cable and audio cable connected to the phone was creating a buzzing sound during AUX port usage. Alas, there is! Enter the HIMBOX from iClever, a Bluetooth Car Kit that not only provides the solution I was looking for, but adds some nice extras. First, it comes with a 4-port USB car adapter, so it can charge the Bluetooth adapter and up to three other devices at the same time. Second, it includes a small magnetic clip, so you can place the receiver (which attaches via audio cable to the AUX port) in a better spot rather than the cupholder. Third, there are two buttons on the receiver that lets you skip or repeat the song you’re listening to. The device is also useful for phone calls – having the call go through the car’s speakers provides a somewhat better experience than using a Bluetooth headset or using the phone’s “Speakerphone” feature. So my car is a bit smarter now – it still doesn’t have self-driving features, but I can now use GPS, let the kids Internet surf and stream music as if I was in a newer car. A bonus thought – the gadgets are small enough where I can transfer all this to the mini-van (yes, I own one of those) for the family vacation!